Media trying to bring him down with doughnuts. There are people who think that the Dane Lindegaard be first choice, atleast for the time being while others continue to defend the lanky Spaniard. Those who knock the Spaniard often label him as slight, skinny or a boy who needs to bulk up. Other criticisms which de Gea has been charged with include the fact that he is a decent shot-stopper but a keeper who fails to command his box with authority. The doughnut incident, while having nothing to do with his on field performances came all at the wrong time, the media leaving no stone unturned in dissing the Spaniard, well it could give them a few extra hits so why not, no? Then, there are others who have continued to back him, bringing out the statistics to back their claims, de Gea had saved the most shots this season before defensive commander-in-chief Vidic’s return and also continues to have the best best saves to shots ratio, keeping out over 85% of all shots on target faced. What needs to be looked at is the fact that at the young age as he is, in such a demanding role many would have crumbled under such mammoth pressure however United’s new number one has done nothing but rise to the challenge lately especially ever since Vidic’s return which has also gone massive strides towards settling the United defence in its entireity. The criticism felt normal. When things go wrong, even a couple of errors, the press has the right to criticise. When you are in goal, you remain in the spotlight forever. What happened is normal – it happens. Now it is in my power to change those negative reviews. I improve in every training session and every game. -David de Gea on the early season criticism flowered on him. Without doubt, de Gea had a tough start to life in Manchester making high profile errors in his first few games for United, none more so than in the Community Shield against bitter rivals Man City, but even in the games that he made those errors in, he did pull off some impressive and some plain audacious saves out of his locker. Rather than crumble to the pressures of life in the big time like some before him- Howard, Foster did, he has since risen to the occasion and made himself a vital piece of the United jigsaw and with a more stable defensive partnership of Vidic and Ferdinand, things could only improve for the youngster. Since the tough starting times, de Gea has come back in the most defiant manner possible, he has regained any confidence lost in his early games and with the guidance of both goalkeeping coach Eric Steele and the manager Sir Alex Ferguson is now showing the world why United were willing to splash out over eighteen million pounds for such a young stopper. 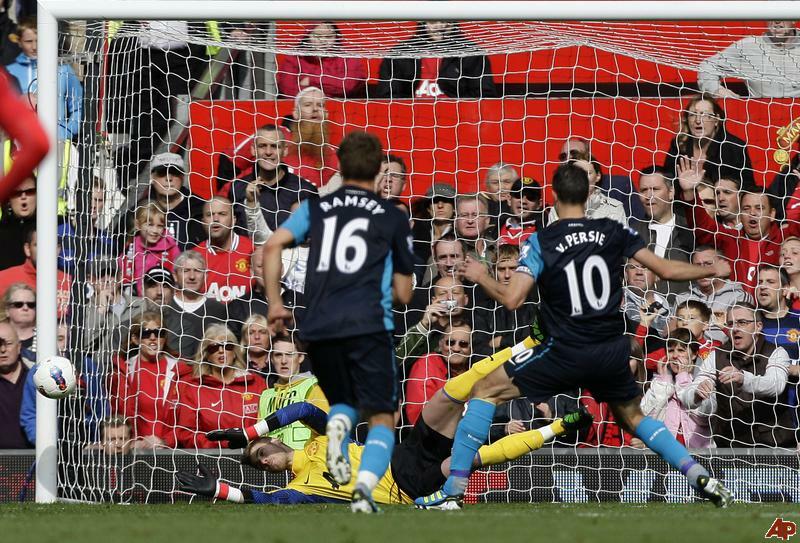 David de Gea saving van Persie's penalty. His strengths and his attributes include his kicking which has been impeccable, there was no aimless hoofing into no man’s land, it was measured, accurate kicking to a fellow team-mate, he knows when to start the attack from the back by playing a simple ball to one of his defenders and when to pump it out long, and with good accuracy, to a forward. Not to mention the ‘physical’ tests he had passed against aerially dominant sides and who are strong with their set pieces- Stoke and Bolton. Little credit maybe given to him for it but the defense put in front of him has been one of the most porous United defences in recent memory that has leaked shots one after and another and yet the de Gea has stood strong and pulled off crucial saves in some of the big games against Chelsea, Spurs or during the 8-2 mauling of Arsenal where he saved a penalty of an inform Robin van Persie. Even with a slight and thinny frame for a goalkeeper, he has the agility and is athletic enough to ply his trade at the very highest level, many times already in his career as a Red Devil, have we seen De Gea fling himself across goal to palm a ball wide. What he actually needs is continuation, to be playing with and understanding the defence ahead of him and work in training on the positional aspect of his game that had been awry on a couple of occasions early on in the season. And the more recent results have probably reflected the hardwork he’d have done in training, pulling off good saves off Rodwell against Everton and then keeping a clean sheet versus Sunderland, and quite evidently Vidic’s presence alongside Ferdinand is going to help him too. He might still be far from being a finished article and is certainly not world class yet, nor is he close to the bracket of Schmeichel or van der Sar. However, he has shown in his short career that not only can he take criticism, whether justified or not, on the chin but also come back stronger, like a duck to water and prove his critics wrong with impressive saves on the pitch. And then again, there aren’t many goalkeepers who have played under pressures of a big club like de Gea does, and on the face of it, time must be given to de Gea to grow and accomplish himself into a proven quantity. An odd error might still happen but surely that must not overshadow the good saves that he does make in the eyes of the United fans. At this point Old Trafford is his stage and goalkeeping his art and time ought to be given to him to portray it to his potential, even for an odd error, this is a world class artist in the making. Quite precisely, the fans need to get on a path that supports him than to diss him for a couple of mistakes. And none of those mistakes cost us in the end either but he’s certainly been doing well lately too. 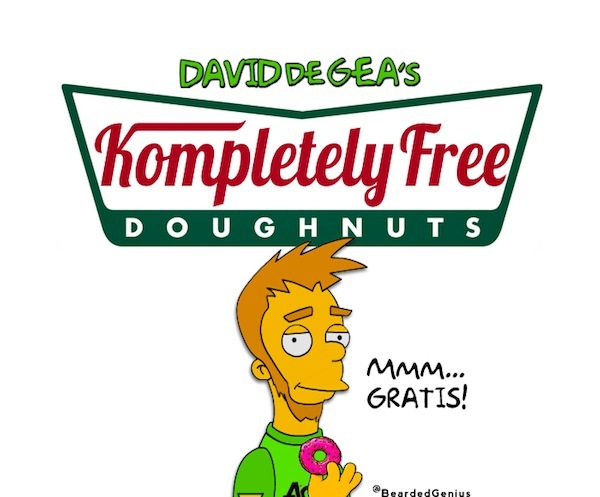 Thanks for sharing, I like David de Gea.